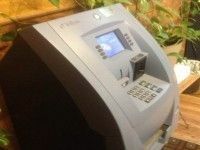 ATMS and cashless ATM-like kiosks remain a primary source of payment at dispensaries. Dozens of recreational marijuana stores in Colorado are allowing customers to purchase cannabis with credit cards or ATM cards. The news has sparked discussion within the industry, as credit card companies have previously maintained a hard line against working with cannabis businesses. The reason for the rise in credit card usage could be because Visa and MasterCard have quietly decided not to enforce their own rules, which was the thrust of a Wall Street Journal story that came out Tuesday night. This development indicates the payment networks are relying on guidance in the August 29th Cole Memo in which the federal government indicated it would not pursue criminal charges against companies working legally under state laws. But not everyone is convinced. Lance Ott of Guardian Data Systems, which processes ATM and credit-card transactions for small businesses, doesn’t believe the credit card systems have eased up at all. Rather, he thinks that businesses are taking advantage of loopholes that allow them to take credit cards, such as miscoding themselves as general health businesses. The card networks, he said, have not yet loosened their standards – and in fact their stance has been consistent for several years. In a statement to the Wall Street Journal, Visa said it still adheres to the rule of law from the federal government, which considers marijuana illegal. But the statement also acknowledged that the federal government’s stance on marijuana is an “evolving legal matter,” so it has relied on its local bank acquirers to determine whether a transaction is illegal. The statement does represent a softer stance than Visa had as recently as 2013, when it disallowed cards from being used for transactions after federal raids in September. Ott said there can be harsh consequences if businesses are discovered to have misrepresented the true nature of their business in standard merchant codes used by the card payment networks. Business owners face fines and the suspension of accounts, and they can even be placed on a Match List, which is akin to a black list for the banking industry. Ott said the best solution for marijuana businesses is still the debit/cashless ATM system, which does not work on the Visa or MasterCard systems. A transaction with these ATM networks is still considered a cash transaction. Ott said he believes true banking and payments solutions could still be several months off. But he said he’s been told from state representatives in Washington that local banks could begin issuing accounts and credit cards when that state rolls out its recreational marijuana program later this year. That change, he said, would assist in legitimizing credit card transactions for the industry. The feds must make a decision “NOW” about the banking regulations for MJ shops!! All that cash is inviting crime!!! I don’t understand the Fed’s. They cannot think, they just know how to carry the cargo to its destination without knowing why they are doing it. Cannabis business works for the patients, works for the legitimate businesses, and works for local, state, and federal governments financial problems through the tax money that each generate.